So I recently encountered this nearly foreign ceremony that I was supposed to perform to the “goddess” of all “Sumangalis”- Lakshmi. Back at the Iyengar household in my pre-wedded era, this particular Puja was blissfully skipped since it was a non-entity in the books of the vertical stripes clan. Now, nearly a year after declaring my collaboration with the Iyer clan, I was expected to follow the whole thanksgiving-to-Lakshmi ceremony. Though the goddess is married to Vishnu, the clan leader of the mighty Iyengars, it is beyond me why we ignore it. Anyway, swathed in a poorly tied 9 yard saree, thanks to a random tutorial by a wise Paati online, the Pujai spanned for two excruciatingly painful hours with us trying to fanthom complicated Sanskrit words from the Devanagiri and Latin scriptures. We spent five hours in preparation. The ceremony, to top it all, had a whole list of, what my mother calls, Nachchu Velais, aka, silly work. So the function had these various steps that put my head in a dizzy but then, since we were two people, we prevailed. I have never imagined the task of cooking and preparing for an important ceremony but I can now tell you that it was a painful pain pain. By lunchtime, we were famished and weak, what with the fast we had to go on until the ceremony ended. So after we reached the finish line, both of us declared our happiness at putting the day behind us for a whole year. While gobbling up the Idli and the Kozhukattai that were the staple food for the Vratham, we remembered that the next day was Avani Avittam, again a Tam-Bhram ceremony for the men. It was that one day in the year when the brahmin men realize that their Poonal is now old and smelly and unless they exchange it for a new one, they would be social outcasts. This is where the epiphany came to me and I reaffirmed my belief that we live in a hugely patriarchal world. For one, Avani Avittam is not all that huge on fasting. It depends on the man. They take exactly forty minutes to do the Pujai, don’t really have to wear the Panjakacham (the male equalent of the 9-yard Madisar), they even found an audio file to make the chanting of the Mantrams easier and since they seldom let themselves see the insides of the kitchen, the women are left with the task of cooking. A menu Kalyanam-worthy. So we the women had to wake up earlier than them. Again. And grind, fried, cut and cooked again. EOD was the same: fatigue. This time, the men empathized with us because all the good food did them in. Later in the day found me arguing with the mister about the partiality that is our society but I ultimately abandoned it after a playful banter. Agreed that I enjoyed decking up my Amman Mugam but until next August, its a big, relieved bye! She is obliously laughing at us! 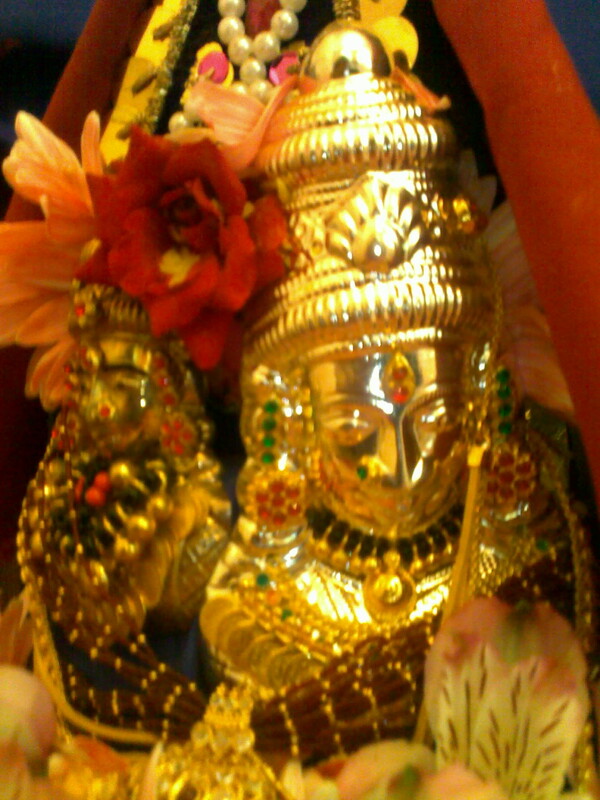 Categories: Food, Musings, Religious | Tags: Avani Avittam, ceremony, cooking, food, hubby, Iyengar, Iyer, pujai, Vratham | Permalink. I admit it. I am a compulsive baker. I love my ancient yet awesome oven and all the scintillating smells it can create when I am in the mood for it. When I first moved here, new to the country and my home, I took an oath: I will venture anywhere in this new land but I will never dare to open my oven to cook food. A few of my friends use it as a storage space of sorts and I actually thought it was a novel idea. Thank god I changed my mind! Hours of watching Food Network and Cooking Channel actually made me curious about the forbidden territory that lay behind the dark door under my stove. For some reason, I hadn’t found the heart to stack my pots there so it lay hollow, like an empty cave. During one of our grocery escapades a month after the relocation, I found a packet of Betty Crocker’s SuperMoist cake mix on sale and decided to grab it. Since then, it has been a journey for me. I read up some oven tactics on the internet and the Food Network website has always been a guide to me. My culinary gurus, Ina Garten and Giada De Laurentiis have never given up on mentoring me (of course, they would be surprised to know that!) For a haphazard cook like me, I have had it pretty easy so far. First of all, I took Ina’s advice seriously. Quantity is really the key to baking. Hence, I decided to move up a step by abandoning my faithful little coffee cup measuring device (I know Rachael Ray did). Lucky for me, I found an inexpensive plastic set at a local store. I didn’t want to give up baking but I was not very keen on taking giant steps either. Of course, I am still a beginner and making scones or croissants is a pretty far away dream to me. But I am hoping to get there. There are so many awesome bakers in this country so I am hoping that being in their radius will rub some of their goodness on me. Anyway, I’ll post a couple of my favorite recipes the next time. They are easy and delicious. Until then, look for a packet of Betty Crocker, Pillsbury or Cadbury cake mix in your local store and have fun. May the baking begin! Ps: People in India can use the perfectly beautiful alternative for the oven there: the OTG. I bought one for my mother from Vivek’s (this is not the exact one but the closest one I could find) and it is amazing! Categories: Food, Television | Tags: baking, Betty Crocker, biscuit, cake, cooking, food, food network, Giada De Laurentiis, Ina Garten, Rachael Ray, usa, Vivek's | Permalink. I am not writing about the Aishwarya Rai starer but about the heat, the Kaaram, the Mirchi we pack in all our Indian food. 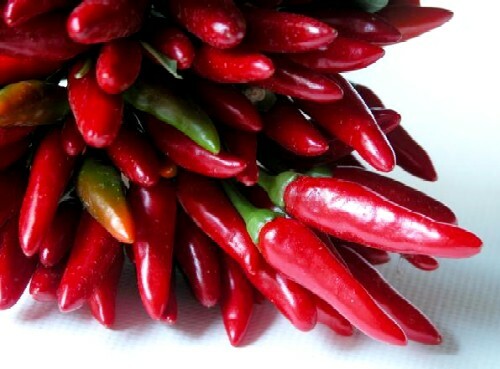 A n all time lover of chillies, be it red or green, I was quick to notice when I started living in this country that the concept of spicy food has a different version. At home, bringing a humble portion of the Nellore side of my family to the table, my grandmother used to be pretty casual about chilies and chili powder. Our Sambars generally contain both and that’s the way we rolled. My mother too, who learned the art from her mother-in-law, followed the recipe and so do I since I started cooking regularly. Hence, when I got the first bite of Mexican food in USA (at Chipotle) a week after I landed, I was sorely disappointed to find it tame in taste. First of all, there was no jalapeno in my salad bowl and the hottest sauce (which my husband actually warned me about in length) was not hot at all! I thought that Chipotle, being a national chain, had perhaps moved a little away from authentic Mexican into an American version that the natives found palatable. I was wrong. A winter trip Mid-West to Texas found me completely desperate to try authentic Tex-Mex food that is supposed to be wild. Our friend took us to this restaurant that specialized in the cuisine and I was warned of the heat yet again. My enchilada was awesome but I had to actually order a side of green chilies to add some spice to my food. When I cook at home here, I always have to remember my husband’s intolerance to too much spice. My two spoons became one and then shrank to three-quarters. Most of the time, my chilies lost their sheen half way through the box and I have to discard them. Categories: Food, Uncategorized | Tags: aishwarya rai, chilies, chipotle, cooking, food, nellore, spice, usa | Permalink.